To Redbrook, on the banks of the Wye, just south of Monmouth. One foot in England, the other in Welsh Wales. Yes, its another winter walk, with the usual mistletoe flavour. Not the main purpose – that’s more to do with exercise, fresh air, and checking out the estate agents’ windows. We walk a circular route, on Offa’s Dyke Path from Redbrook to Monmouth, and back via the Wye Valley Walk. Last time I did the first part of this walk was 1979, as a spotty student building self-confidence before going off to University. I did about half the whole Dyke path then – 70-odd miles, before admitting my boots needed more walking-in first. Looks just the same on the ascent up the Kymin, a hill between Redbrook and Monmouth. But the noises are different – a angry wasp sound gets louder as we ascend, soon to reveal itself as a Moto-X track, with loads of kiddies with expensive toys going round and round in pointless noisy circles in the mud. Hmm! Haven’t they got anything better to do? We soon leave them behind though, and reach the Naval Temple on the Kymin, erected c 1810 to commemorate British victories over the French, Spanish and Dutch. Not v PC these days – but gripping stuff! Lots of names and dates of battles, mostly in the 1790s. 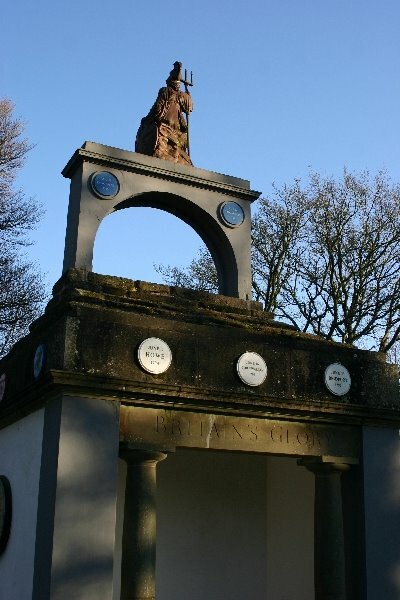 These battles are largely forgotten now – but judging by this monument you’d think we had nothing better to do back then. (We did do better things of course – the Ind Rev was then in full swing, and the canals were all getting their Acts of Parliament). 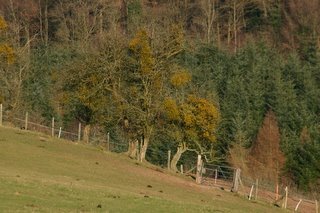 Some good mistletoe on the way up… on field boundary hawthorns and whitebeams etc… Looking very yellow in the winter light. 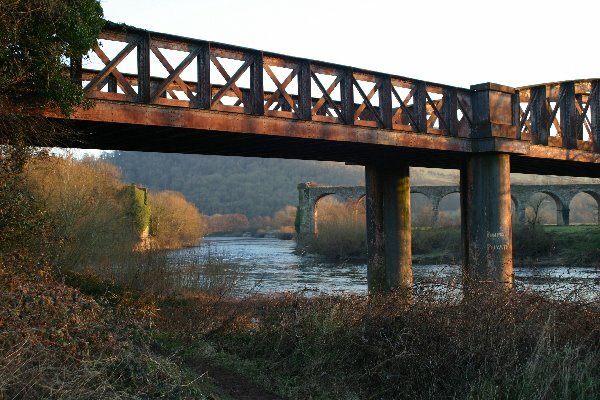 The river has a few surprises – these two old railway viaducts recall the industrial days of the Wye Valley – when there were mills of all sorts on the tributary streams, and the rivers ran red with the rust colour from the local ironworks (hence “Redbrook”). One is, obviously, defunct, the other is in use as a footpath. 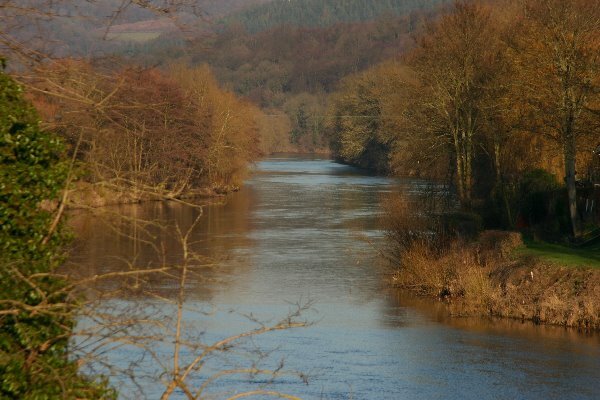 Lots of wildlife on the Wye – swans, ducks, moorhen, heron etc etc. And such a change from our usual canals – this is proper moving water – and lots of it. Get your Valentine’s Day Mistletoe here! A TEME team meeting, to discuss Valentine’s Day!! Mostly to discuss another mistletoe marketing experiment – mistletoe for your valentine. 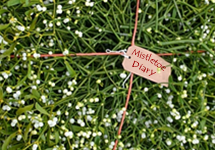 Soon to be available at www.tenbury-mistletoe.co.uk. Not to mention the grow-your-own mistletoe kit. 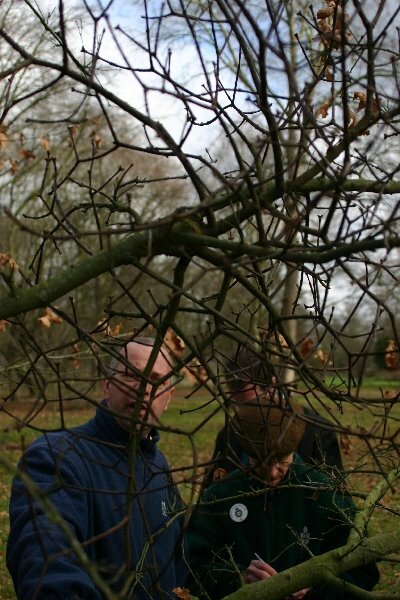 A trip to Kew Gardens, to attend a meeting of the London Biodiversity Plan Mistletoe Group. As regular (!) Mistletoe Diary followers know, this is a group endeavouring to conserve London’s mistletoe, and create new colonies. This is the mystery mistletoe… growing on a Black Oak, and looking suspiciously like Loranthus europaeus – a deciduous species of central Europe. What it’s doing here no-one seems to know. 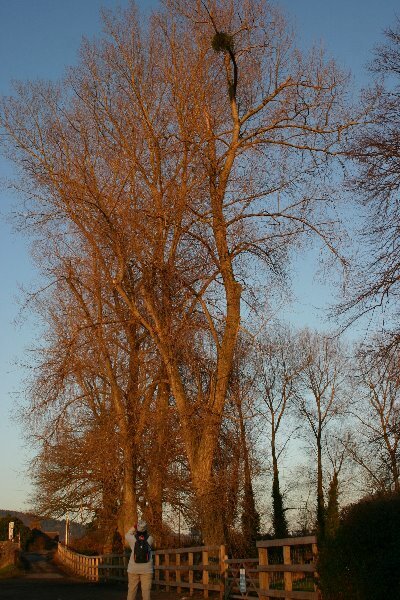 Note that the immediate clue is just a swollen branch – no evergreen leaves here. 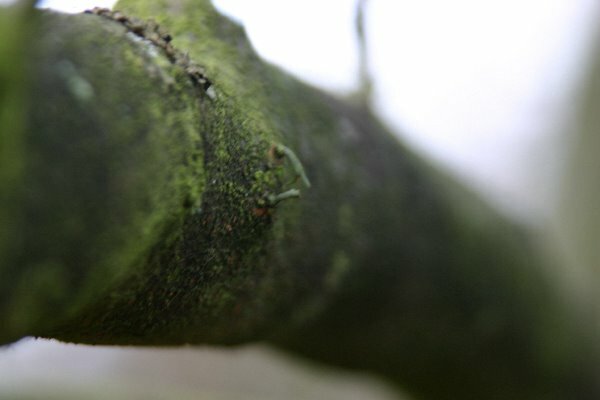 Close inspection shows that the branches differ markedly from the host. And then the search for those seedlings… We know they’re on this tree somewhere. And at last, here they are… tiny, 2-year-old mistletoe seedlings… More on these in due course. Seems a long time since Christmas already – but mistletoe business is looming again already. 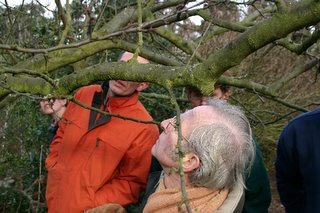 Meanwhile I’m reviewing what needs to be done in London this season – where the London Biodiversity Plan is encouraging establishment of new mistletoe populations. February and March are the best planting season – and a meeting has just been arranged later this month to plan activities this season. 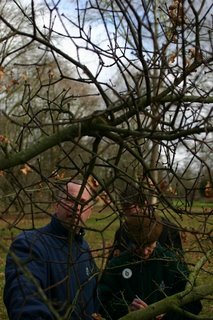 It’ll be at Kew, where some new mistletoe plants have already been established. 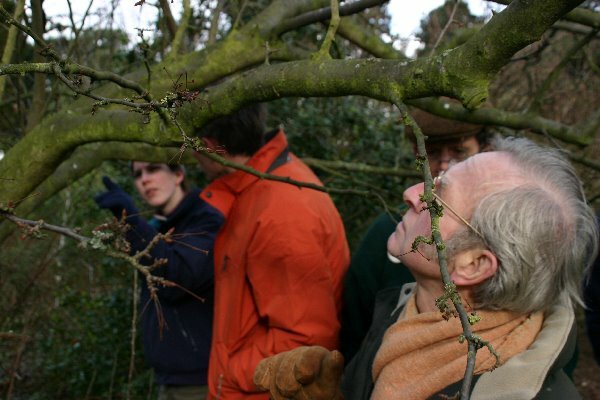 More on this, and other mistletoe plantings, in due course.